The orange jump-suited felons of Prison Architect have escaped, and are causing havoc around the home of the Humble Weekly Sale. It's Introversion's turn this week, with a pay-what-you-want offer that will secure their back catalogue, including Uplink, DEFCON, Darwinia, and Multiwinia. And, for the next few hours, you can pay $20 to get their early access prison management sim for 33% off its regular price. The Prison Architect deal runs till 7 pm BST (11 am PDT), today, (the 9th August), after which the game's wardens will round up the fugitives and lock them more securely - only accessible for a still discounted $25 purchase. The bundle also comes with a variety of extras from the Introversion vaults, including soundtracks, source code, and tech demos from the indie developer's cancelled game Subversion. What it doesn't come with is a fetching, and indie-centric issue of PC Gamer UK. Only the free Introversion Bundles that are placed inside said issue of PC Gamer UK will also give you access to that issue of PC Gamer UK. THIS IS THE END OF THE SHAMELESS PLUG SECTION. The Introversion Humble Weekly Sale will run until Thursday, August 15th. This article originally appeared in issue 247 of PC Gamer UK. Written by Owen Hill. As a game designer and co-founder of Introversion, Chris Delay is a respected, successful indie developer. He and his partners, Mark Morris and Tom Arundel, won the grand prize at the Independent Games Festival for their virus-infected strategy game, Darwinia. They’ve haunted a thousand multiplayer servers with the spectre of global thermonuclear war in Defcon. They’ve also established themselves as a cornerstone of the independent developer community. But before all that, there was just Chris and an idea. “By the end of sixth form I had the idea for the game. It was going to be like Frontier Elite 2, in which you fly a spaceship around and visit starports and upgrade. I wanted to do that, but in the online world.” He called the idea Uplink. When it was released, Uplink was an austere, menu-driven hacking simulator, where players navigated electric blue interfaces to manipulate mainframes, race against progress bars and escape without trace. It took place in a murky, cyberpunk world where the act of electronic pilfering was fast and panicked, sleek and cool. A world viewed through a computer screen within a computer screen, where the player was always seconds from detection. How did Uplink get from that Tron-like idea of flying inside your computer to a slick vision of hacking? Chris calls his Uplink notebooks ‘bibles’. Uplink was inspired by classic ’80s movies like WarGames, where Matthew Broderick cracked into government computers with a tape deck and a few typed command lines. Whatever the game was going to be, it had to be similarly streamlined. Even when removed from the dull slog of real hacking, Chris was sceptical that his game would ever be commercially viable. “I wasn’t even planning on releasing it publicly,” he admits. “It seemed that the subject matter, lack of 3D graphics, and dominance of the big-name publishers would make this game impossible to sell.” This was in 2001, a short while before indie game development became popular, or minimalism was an accepted game design choice. Given that it’s the simple, 2D menus that keep Uplink timeless today, we’re lucky it turned out that way. Early in development, Chris’s hacker vision was clouded by a slightly more modern movie. He was drawn to the futuristic world depicted in 1995 cyberpunk action flick Johnny Mnemonic. The ideas they contain are surprisingly cogent and recognisable. It set development off in the wrong direction, and it took two months before he jettisoned the idea of a 3D world. “I think 2D’s brilliant. I love 2D to death,” Chris says with the benefit of hindsight. Far from discouraged, though, the setback made him focus more. He grabbed a notebook and started writing down every idea he had for Uplink. Chris calls these touchstones his bibles, and it’s a fitting name. The notebook pages you can see in this feature are an uncannily accurate representation of the final game. They aren’t a set of notes, they’re synoptic gospels. There were three of them in total, used to store Chris’s ideas before they evaporated. He’d jot them down in university lectures, or moments of inspiration. “It was probably 12 months before what you see on those pages ended up on screen,” he says. As a kind of tribute to their importance, Chris even made the books available in-game, on a secret server. The original Revelation Virus, which still features in Uplink in a different form, would trap hackers, keeping them fixed to their CPUs and starving them over time. Eventually, Chris’s flatmates and future founders of Introversion, Mark Morris and Tom Arundel, got to see Uplink in action. The interface was brutally unforgiving, but it showed promise, and impressed them enough to invest. Mark and Tom created a business proposal. “The gestation was that in Imperial College in the final year there was a business competition, and the premise was you had to write a business plan and submit it. So we wrote a business plan for Introversion before the company really existed.” The plan didn’t place in the top three, but it was good. “They estimated that we would need maybe £200 each to get the company off the ground – a tiny amount of money,” Chris says. So they did it. Introversion was formed on £600, and no more cash has ever been injected into the company aside from earnings from game sales. An uncannily accurate picture of the final game. The three friends spent £100 on legal fees to register Introversion. The other £500 was spent on printers and blue ink, so they could print the game’s now iconic artwork. “We had no advertising budget to speak of, no money to pay for production, and no formal training in any relevant areas such as marketing or advertising. We didn’t even have a proven game concept,” says Chris. Fortunately, they had the smarts to send the game out to the press. One copy landed on a desk here at PC Gamer, where Kieron Gillen awarded it 80%. Uplink started to sell. Chris, Tom and Mark were burning the game to CDs, printing their own labels, and packing the parcels in their living room. Uplink was Chris’s creation, but it was Mark and Tom who pushed the game out to the world. “They were talking about doing a shop version,” says Chris, “What? Get it in the shops? Next to FIFA and Warcraft?” They managed exactly that, with a lesson in distribution from the manager of a local HMV. The freshly-formed company picked UK game distributor Pinnacle Software to publish Uplink. And sure enough, HMV ordered a batch of 10,000. “We kind of did the shop deal in the same way as the game. It was all absolute first principles: start from nothing, then figure it out,” explains Chris. The first copies of Uplink were burned, packaged, and sent out by the gang. Minecon wasn’t only about Minecraft. Mojang were good enough to invite along the bright lights of the indie dev scene to give a series of inspiring, funny lectures, describing how they got into the business and what they’ve learnt along the way. Taking to the stage in chronological order: Hello Games, purveyors of deceptively chirpy stunt-biking game Joe Danger; C418, Minecraft’s maestro of electronica; Introversion, creators of Uplink, Darwinia and the tremendously tempting crowdfunded clink-sim, Prison Architect; Suspicious Developments, aka Tom Francis, aka maker of Gunpoint, aka PC Gamer writer, aka man sitting two metres two my right as I type this and looking rather dashing too, I might add; Mike Bithell, the dev behind clever platformer Thomas Was Alone; and Mode 7, creators of simultaneous turnbased-tactics masterpiece Frozen Synapse. Hit the jump for the videos of each talk, and watch out for our PCG-helmed indie dev round-table which we'll publish in the next few days. Hello Games' supremely talented artist, Grant Duncan, takes the mic to talk about conjuring Pixar-like delight from pixels and polygons in Joe Danger (and also to tease Hello Games’ next aesthetically divergent title, quite possibly coming to PC, currently going under the codename of Project Skyscraper). The effervescent Daniel Rosenfeld, also known as C418, talks about the production of Minecraft’s electronica score, game music in general, his album, and the soundtrack for the upcoming Minecraft documentary (teaser clip within) - all in some impressive technical detail. A must for electronica nerds and aspiring musicians. British indie-dev double-act, Mark Morris and Chris Delay discuss the long and bumpy road they’ve taken, from early hits Uplink and Darwinia, to the calamitous production of Multiwinia and the aborted Subversion. But - spoilers! - it has a happy ending with the hugely successful crowdfunding of clink-building sim Prison Architect. PCGamer’s very own tame indie developer, Tom Francis, discusses how being mean to games professionally has helped shape his development practices on Gunpoint, and how becoming a developer has changed his perception of the games he writes about. The supremely affable creator of Thomas Was Alone discusses its origins as a rough-hewn Flash experiment and how the curiously emotive reaction to it - which saw players ascribe human thoughts to its simple cuboid avatars - snowballed into a project capable of attracting accolades and high-profile voice-actors. Paul Taylor, the co-director of Mode 7, who heroically multitasks as a musician and creator of hilariously terrible PowerPoint slides, tracks the company’s evolution, from its early swordfighting game Determinance, to the terrific tactical tour-de-force which is Frozen Synapse. What began as Good Old Games, GOG.com, has relaunched to sell new PC games alongside old. Therefore, the Good Old Games meaning will fade away. The company will be known instead by the acronym-turned-company-title GOG.com. "It doesn't matter what G, O and G stand for," explained a post on GOG.com. "Gee Oh Gee dot com stands for high-quality, DRM-free gaming, each week with bigger and newer games." Trine and The Whispered World are examples of 'new' games available right now. Legend of Grimrock is out 11th April. Spacechem, Machinarium and Darwinia are "coming soon". Apparently, more than 20 indie and new games have been signed for release in "the next few months". The GOG.com website has been redesigned, and the GOG.com downloader improved. 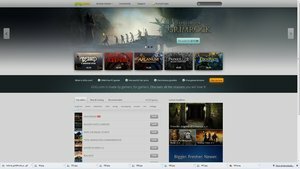 CD Projekt used homemade RPG The Witcher 2 to test GOG.com as a destination for newer PC games. The result? Around 40,000 sales - the best result of anywhere but Steam. They say you should always be prepared to kill your darlings. Darwinia creators Introversion have taken it one step forward, creating nothing short of a Darwinian snuff movie to mark their transition from little computer people to… prison architects. Yeah, that’s still a little weird. But never mind. Help them celebrate this glorious new age of Not Darwinia by enjoying 2:36 minutes of burning, shooting and stabbing that really puts the ‘aaaaargh!’ into ‘carthasis’. These Developers Just Took Their Characters Out Back and Shot Them. For Real. There's retiring old video game characters by not using them any more, and then there's retiring old video game characters by building little models of them and destroying them. Introversion, the developers of strategy game Darwinia, are done with the property. Having worked on it in some for another for nearly a decade now across its various forms, by 2010 they'd become so sick of the thing that they couldn't just let it go quietly into the night. They had to kill it. With fire. The Humble Bundles keep on rolling, with a new 'pay what you want' indie mega-bargain arriving mere weeks after the last one wrapped up. The new Humble Introversion Bundle packs four games from English indie Introversion: hacking sim Uplink, RTS Darwinia, its multiplayer sequel Multiwinia, and Cold War 'em up Defcon. The Bundle also includes two Introversion tech demos, the procedural city generator used in Subversion and a voxel-based destructible building demo. As Subversion is on indefinite hold, it'll be nice to get a good look at some of it at least. On top of that, if you pay over the average price, you'll also score Humble Bundle veterans Aquaria and Crayon Physics Deluxe. The Bundle has already outsold Xbox Live Arcade's Darwinia+ within 41 minutes on sale, Introversion revealed on Twitter. As ever, all games come DRM-free, but you can activate them on Steam if you fancy. And, as Humble Bundle tradition dictates, you can choose how you divvy up your money between the developers, organisers, and the Child's Play charity and the EFF. Head on over to Humble Bundle to name your price. Darwinia and Defcon developer Introversion stopped working on Subversion nearly a year ago, Eurogamer has discovered. Subversion resembled a collection of tech demos but "the core game itself wasn't really that great", creator Chris Delay told us. "What happened was, we were tinkering away on Subversion for ages and ages, trying to make some progress - and we did make a lot of progress on it - but we always had this worry that the core game itself wasn't really that great. There wasn't really much to do. "We had literally years of tech demos but no sort of cohesive core game. It's the core game that was missing. "Whenever we stopped and thought about it from a high-level point of view, in terms of what's the player going to be doing, where's the fun going to come from, we were drawing a bit of a blank, all the time. "We finally faced up to it," he said. Subversion, an infiltration and espionage game where gamers controlled a team of operatives moving through hostile high security buildings, is officially now on hold. "It's on hold and we openly told everyone to forget about it for now, pretend it doesn't exist if you can." "Yes, that's exactly what it is," confirmed Delay. "It's on hold and we openly told everyone to forget about it for now, pretend it doesn't exist if you can. "We do plan to go back to it - that's our firm intention, to go back to it after this game. But we wouldn't want to promise it or anything like that, or for anybody to get their hopes up, because we're a small company and we can't work on more than one project at once, so we always have to pick what we're going to work on. "We had quite a few chats to discuss what we wanted to do and switched whole heartedly onto Prison Architect, and Subversion hasn't had anything done on it since then. Prison Architect, a game about building and managing a high security prison, "fell out" of Subversion, Delay explained. There was a Subversion mission where you had to "bust" a team mate out of jail, apparently. "You had to get this computer hacker out of prison," Delay said. "And we started all this work on this prison code code, and it was turning into a massive project just for one level. "While we were doing it, laying out the prison in our Subversion map editor was actually really good fun. And that's the gestation of it, really - that's where it came from." Prison Architect will be a PC game and, Delay said, probably also for Linux and Mac. "It's still too early for us to say a lot about Prison Architect," Delay said. "We find it difficult to pace this stuff, because it's still a while off being released, and we don't want to give it all away at this point. "It's not a 2011 game, but we're hoping for early next year to be launching this thing." Prison Architect was recently submitted to the Independent Games Festival - the same competition Darwinia won back in 2006 - and Introversion hopes to launch around the time of the IGF awards (March 2012). "That was a very different time, when Darwinia won. Even now I don't believe Darwinia would sweep the awards," said Delay. "It was a different era then." Six years ago, Introversion was crowned king of a soon-to-boom indie world. Today, Introversion still clings to those same high points. Mistakes were made, hard times were hit. But Delay is upbeat about the health of the British developer today. "We get people on the forums and things going, 'Have Introversion gone bankrupt or something?' People really worry about Introversion because we did hit some really rough times, around 2008, 2009 time," Delay said. "We don't even have an office any more. We got rid of our office; we've come right down to just the core team." "We don't even have an office any more. We got rid of our office; we've come right down to just the core team. There's only a handful of us. It's like the first days when we started out and there was just three or four of us working on something, all working at home, just on the next new game. We've kind of got back to how it used to be, and we're quite enjoying it now for that reason, because we're able to just go ahead and make our own game again. "It seems like a simple thing, but we didn't have that for a long time. We had a big team; we were up to 11 staff at one point, which doesn't sound that big, but that's very big for Introversion. 11 staff and a few freelancers all working on console versions of the game and stuff like that. We were a much bigger company then and we were spending a lot of money each month. That's what it ultimately came down to. And it wasn't really that sustainable like that. "It sort of required us to have big success on the consoles, which Darwinia+ never really achieved. It actually continued to be outsold on Steam, even though the game's been out on PC for ages. The Steam versions and all the PC versions of Darwinia just carried on doing better. "We thought [Darwinia+] was a bit of a misstep, a bit of a mistake, and luckily we have enough games out now - four main games and one console game - that continue to sell to this day, and that keeps us going." Darwinia developer Introversion has announced a new game called Prison Architect. In it, you "build and manage a maximum security prison", Introversion's creative mind Chris Delay told Rock Paper Shotgun. No other Prison Architect details were offered. Subversion, Introversion's other project, is on hold. Introversion won worldwide acclaim with strategy game Darwinia. Defcon, Multiwinia and ill-fated XBLA project Darwinia+ followed.